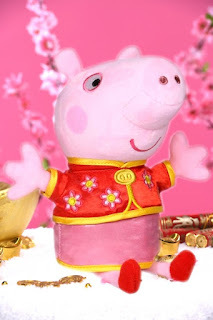 The lovable Peppa Pig welcomes Chinese New Year in the traditional spring festival costume. Available this February at Toy Kingdom. The kindly child born in the Year of the Pig is the heart and soul of any gathering or family unit. Self-reliant, easygoing, sociable and steady, this little goodwill ambassador is the kid every child and adult can agree to adore. He works as hard as he plays, and has many friends. Dependable, dedicated, and determined, he perseveres where others would admit defeat. And should he experience defeat, he shakes it off with without discouragement. A generous dispenser of hugs, kisses, and bottomless faith, your little Pig is an absolute treasure. He possesses the biggest heart around- unselfish, boundlessly sympathetic, generous, trusting, faithful, honest, sincere, and gallant: he will be your biggest fan and staunchest supporter. SM Accessories Kids and Toy Kingdom celebrate the Year of the Pig with a collection of cute, lovable, and huggable pig plush toys and novelty items that will bring out the pig child in kids of all ages and zodiac signs. Led by the adorable Peppa Pig herself, these will not only make playtime lots of fun, but also bring lots of love and luck for Chinese New Year and beyond. These are available at the SM Accessories Kids department of The SM Stores and at Toy Kingdom.